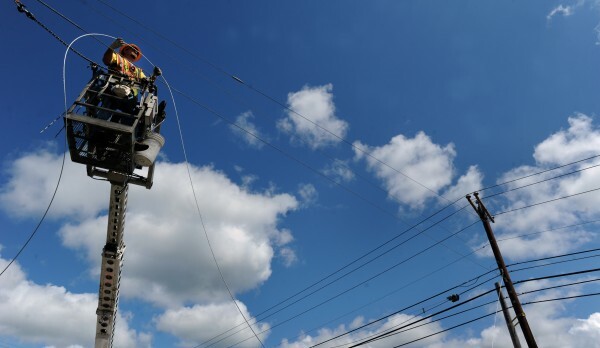 In this July 2011 file photo, a foreman with NextGen installs a guy wire on a utility pole, while his crew lashes fiber-optic cable on a support strand wire along River Road in Bucksport. BIDDEFORD, Maine — Lee Ulrichsen, who operates a pottery business from her home on Nokomis Road in St. Albans, has spent hours fruitlessly uploading photos of her work to clients, only to have the files lost somewhere in the ether. “I have to follow up every email with an attachment with a phone call to make sure they got it,” Ulrichsen said in a phone interview. Those problems have caused her to cancel sales to ready customers and await availability of a wireless Internet option from the Bangor-based startup Airocomm. “I run a business from the house, and I depend on it,” she said. Ulrichsen is among many people in rural parts of Maine seeking better high-speed Internet access, and the conundrum of extending it to those areas dominated conversation in a forum organized by the economic development group Mobilize Maine on Wednesday at the University of New England’s Biddeford campus. State and national experts who gathered said that access will be critical if the state is to reconfigure an industrial economy. Companies such as the Rockland-based online marketing agency Dream Local Digital are a part of that shift, building a company that competes for national and international work with agencies in major cities and dependent on quality Internet access for itself and its clients. “While we’re located in Rockland primarily for other reasons, if high-speed network infrastructure wasn’t available, there’s no way we could stay here,” Jeff Howland said in an email. A report from ConnectME Authority, created six years ago to expand high-speed Internet access, found that in 2013, Maine still had about 40,000 households without high-speed access. About 93 percent of Maine homes have access to Internet delivering up to 768 kilobits per second, a speed the report identified as “broadband.” Nearly 73 percent of households subscribe to some type of broadband service, compared with 68 percent nationally. “The biggest barrier to adoption is not cost, it’s lack of knowledge of the value of the Internet, lack of knowledge of the value of a computer and lack of knowledge about how to use that,” said Phil Lindley, executive director of ConnectME Authority. Education is one part of the effort that experts said they expect to be led mostly by municipalities, where last-mile connections will reach end-users. “Many things state and city officials do today will affect what kind of broadband networks they will have in 10 years. And in 10 years, whether it is faster, cheaper and better, broadband will affect everything that state and city does,” said Blair Levin, a former executive director of the Federal Communications Commission’s Omnibus Broadband Initiative and a fellow at the Aspen Institute Communications and Society Program. In efforts to address that infrastructure challenge, a number of companies involved in the forum plan to work on new projects and test new wireless technologies this year to expand that type of service to more parts of the state. Experts agreed that organizing those efforts at the local level will be key to the state’s economic future. “We’re going to reach a point where a community cannot be economically viable if it doesn’t have broadband,” said Fletcher Kittredge, CEO of Portland-based Great Works Internet, which was a leader in the effort to build a statewide fiber-optic loop. But improving “broadband” service will likely be an ongoing task, Kittredge said, noting that the term has no technical definition. For municipalities, experts said gathering interested parties together and demonstrating to a provider that there is enough interest to support expansions is one strategy — in other cases, greater collaboration and public investment may be required. For areas where traditional providers still have not ventured for lack of an adequate customer base, Jeff McCarthy, vice president of business development for Maine Fiber Co., said public-private partnerships using an open access network such as the Three Ring Binder, which his company manages and built with federal funds, could provide a solution. “There’s an opportunity for communities to come together and build a public-private network and interconnect with our network or others and get over the hump here and get out of a situation that looks frighteningly like a monopoly or a duopoly,” he said, referring to customers who most often have one or two providers in Maine. Josh Broder, head of the Portland-based telecom and IT company Tilson, said that key to communities’ planning is defining a specific goal rather than a general aim of increasing broadband. “[Broadband development] needs to be guided by clear priorities of what a community wants to accomplish beyond the understanding that broadband is good,” Broder said. Part of the discussion touched on the 1,100-mile fiber-optic cable network completed in 2012, which 24 companies have tapped into to expand high-speed access. With that network in place, providers such as Corbett’s Axiom Technologies are focused on what they call “last-mile” connections to end-users such as Ulrichsen in St. Albans. Corbett is in discussions with a Virginia-based company called Declaration Networks, which plans to expand broadband Internet access by sending information on unused television frequencies referred to as TV white spaces. Bob Nichols, the company’s CEO, said Wednesday that the 2-year-old startup company plans to deploy its first networks in rural parts of West Virginia and Maine, which both rank low nationally for Internet speed. “If we can do it in West Virginia and Maine, we can do it anywhere,” Nichols said. The technology does not require a line of sight between a tower unit and an end user, which Corbett said could remove one barrier of technology her company has used in the past that had to account for interference from trees, buildings and other obstructions. GWI also is pursuing a new strategy for expanding fiber-optic connections to end-users in the coming year. Kittredge said his company is going to pilot a new structure for building out lines that would be owned by municipalities and lease bandwidth to an Internet provider.